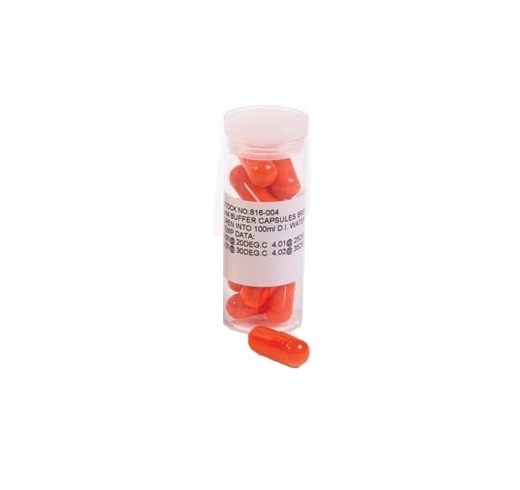 pH Calibration Buffer Capsules - These ready-made pH buffer capsules are available in three different values and are suitable for checking pH instrumentation and pH electrodes on our range of pH meters and testers. These capsules make it a simple matter to regularly check your pH meter or tester is accurately calibrated, and giving you the best possible results. These DIY pH buffer capsules are available in 4 standard values, 4.00 pH, 7.00 pH, 9.00 pH and 10 pH. Each capsule makes 100ml of solution when mixed with distilled water. Supplied in packs of 10 capsules.